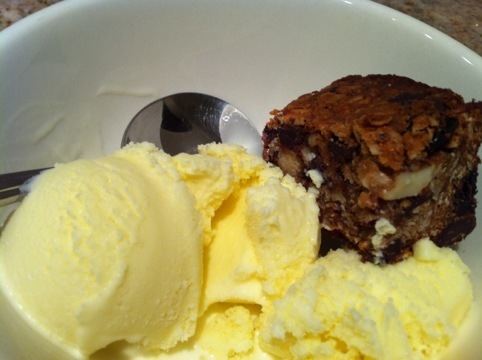 Post State of the Union treat: homemade granola bars and ice cream. Come together. Right now. A good time for some healthy comfort food. I read what the local newspaper said about the speech, but since news has a way of leaving things out and outright lying I’ll wait until I actually watch it to see what I think. I just got an email from the Seed Saver Exchange saying their yearbook of heirloom seeds will be on it’s way. I can’t wait. I hope they have some bamboo in it too. Both TheSelfSufficienctGardener.com and GrowingYourGrub.com have had podcasts about planting seeds and planning your garden in case anyone is interested. It’s getting around the time where some seeds can be started indoors. I’m curious how you plan to use your bamboo? Is it just for privacy or…? I’m taking a hard look at my garden and am considering making space, which might mean taking out a cherry tree that’s only struggled since I first put it in the ground several years ago, and the ever mysterious dogwood(?)/elderberry(?) bush that looks pretty but is also prey to neighborhood birds who always have gotten to it quicker than me. At first I was thrilled it survived at all. As I started finding out more about it I began getting ideas. Most recently I am thinking of growing a privacy screen in the yard along part of my back fence. Perpetual floodlights and motion lights are annoying at best, especially in the winter when my trees are bare. Bamboo is great for a fence or privacy screen since it can grow from a few feet to 70 or more feet tall depending on type. Some can grow 4 feet per day!! As with all good things there are cautions. The wrong types improperly planted and cared for can turn into a mini jungle that can easily invade neighboring yards. I’ve seen pictures of it growing shoots right through a roadway! I joined this great forum that’s nothing but bamboo enthusiasts. I’ve been scared to plant boo in the ground (there’s lots of horror stories on the net about bamboo gone wild) but knowing more now I may go for it. I am not going to use the one I have though. It’s a ‘running’ type which spreads. Instead I will probably get a ‘clumping’ bamboo which stays pretty much in place. I will grow it in a raised bed as a precaution. Aside from a privacy screen I am thinking about a few pots on my back deck. Those can shade the back wall of the house which bakes in the afternoon summer sun. Many bamboos loose leaves in the winter so they will let the sun back on the wall in winter for heat. It’s amazing how nature works! I can’t take credit for the shade idea Someone on the bamboo site has their own bamboo site with pictures of bamboo, and places it should or shouldn’t be planted and why. They have a PDF catalog you can download with lots of great information. The uses for bamboo seem endless, but aside from garden poles (I have some store bought bamboo garden poles) it will take a quantity of bamboo for material to make stuff. I’ve even seen cups made from large diameter bamboo for sale. I would like to grow some 3 or more inch diameter bamboo, but from what I’ve heard it needs to be in the ground. Maybe some day, for now baby steps! Excellent. This is great — thanks. I’ll definitely be able to use this. I heard an interview with the makers some time back where they explained how the soap is made and the ingredients that are used in the soap. Check out the site. I’ll let you know what I think after the soap shows up. I think a better bet is to buy from a person who you can ask questions to directly, and make sure that you’re satisfied with the answer (and how the product works) before spending a lot of money. It seems so many items are purchased just out of habit, and rote mechanical ritual. It’s impressive that you’re putting your money where your words (and obviously sincere belief that we can use our consumer power more wisely) are. Good luck, and can’t wait to hear how it goes! Let me know if you can make a recommendation. I think it was the Survival Podcast interview talking about soap where they said skin was the body’s largest organ, and people don’t realize that despite it’s amazing strength so many chemicals can pass through it. One of the soaps I am kind of curious about is made with tea tree oil. If I recall correctly tea tree oil is a natural and effective fungicide. I’ve never had it, but I wonder if someone with athlete’s foot would benefit from that. The various soaps are made using different essential oils, so I guess I should do some research on oils. I never really looked into them. They are the ones that say “Good soap, no crap”. A very catchy slogan you’ll never see on TV! That interview was on http://www.SSHomestead.com some time ago. Both those soap makers told the whole process of how they make soap and what goes into it. Interestingly one mentioned that they let their soap dry a couple days after it’s made. That makes the bar harder and it lasts longer than the softer commercial soaps. My home made soap showed up in a USPS envelope today only 3 days after placing an online order. Opening it, spearmint was the first smell I could identify. Each bar was in it’s own cloth bag with a drawstring on top. I had thought they would come wrapped in a paper or cardboard wrapper. I could think of a few uses for those cloth bags as I empty them. All but one bag had a handprinted label identifying the type of bar inside. The remaining one had a printed label with ingredients. The website, http://www.simplycleansing.com/soaps.html has the ingredients of all their soaps. Maybe it’s just me, but often, taking a good smell from commercial soap causes me to sneeze. Not so with these. In fact I took long slow breathes inhaling each bar as I took them out of the envelope. They smelt great. Orange, lemon, and peppermint to mention a few. Back to the spearmint. If you ever picked fresh spearmint leaves by hand you know exactly how the spearmint soap smells. I guess that should have been no surprise since the soap contains spearmint essential oil and spearmint leafs. At least to me, that was the strongest scented of the 8 types. There’s also a plain soap. I’ll have to decide on one and take it for a test drive later. Not having 8 extra soap dishes it will probably take me a while to try all of them. I’ll post an occasional update. I decided to try the patchouli soap first. Not knowing what patchouli was, a quick check in Wikipedia proved interesting. The soap has a nice odor to it, and a few hours after I put it in the soap dish there was a slight smell of it in the air. If you currently use one of those chemical based air fresheners you probably won’t need them, and the natural oils are no doubt healthier for you. In use the soap seems a little more slick/ slippery than commercial soap. Use a little extra caution if using it in the tub. Except during gardening season my hands don’t really get very dirty so I can’t say for certain how well it cuts through dirt. I do know that it is the ‘slick’ property of commercial soaps that does the cleaning, so it’s probably safe to say the patchouli soap will clean at least as well. After a few days of use I have noticed that my hands actually do feel smoother. I found that interesting since my hands really aren’t rough to begin with. Using the soap did not leave any strong scent on my skin, but if you hold your hand close to your nose you can detect a slight smell. Maybe I can rinse my hands better, but I actually like the smell. A good soap is hard to find. Last week, I had to throw out a whole bar of Dove because the smell was overpowering. I’ve always been sensitive to smells — I don’t like most perfumes and many manufactured scents make me ill. I don’t know if this is an allergy or if it’s just that our noses aren’t built to withstand the overpowering chemicals used to make these fake smells. Either way, I am always on the look out for a good, simple, not overpowering soap. I’m looking forward to your final recommendations. By then, we should be at the end of February and I will be over my month of no discretionary spending. I’m following the frugalista approach: http://www.thefrugalista.com/2012/02/no-buy-month-in-the-news/. So far so good although I did blow a buck the other day when I dropped it in a (very talented) subway musician’s guitar case before remembering that I committed to spending no money unnecessarily this month. I looked down at it and though I envisioned it in my mind for a split second, I concluded it wouldn’t be right to reach in and grab it back. Last night as I reached for the shampoo bottle I put it back down thinking of what chemicals were probably lurking inside. Instead I just used the patchouli soap to see what would happen. No conclusions on that yet. Cutting expenses is always a good thing, especially with the economy the way it is. I do spend money which I know is not necessary, but not to excess. Some of it I can justify, some I really can’t but I know I can stop spending it if needed (don’t drug addicts say that?). For a while when spending money, especially cash, I would convert it into it’s equivalent in silver in my mind. If I spent maybe $30, I would think ‘that’s an ounce of silver’ I could buy instead. Sometimes I kept the cash, often after some though I spent it anyway. One thing I’ve been doing more is research before buying. I look to see if other people like or dislike the item. Most recently I did this with a pair of winter boots. I probably spent about the same I would have if I just went to a store, but research told me these boots were really worth the money. Reading reviews are not quite straight forward, you have to learn to ignore certain things people say. On my boots, one review said the sizes ran small, another said they were larger. I figured they canceled each other and ordered my normal size which fit just right. Jason did a great job on the topic and went into more details than I’ve heard on the topic so far. Among the things he mentioned was NOT to use fresh cut wood for hugelkultur. It’s a really informative show, so give it a listen.